This is no creme brulee torch, no sir. Note: These are back in stock. We had another batch made and they’ve arrived. Woohoo! Grab ’em while we’ve got ’em. We can always re-order more torches, but if you’ve watched this page you know there is often down time between batches. Rodmaking season is heating up. Heat your season up with a professional quality bamboo torch of the sort used in the original Whitehead shop and in our own GW shop. Be sure to check out the Product Review posted in The Planing Form, a copy of which is posted at the bottom of this page. Thanks! The bamboo torch has returned. This torch is meant for bamboo, and it’s so much better than trying to flame cane with a weed burner (yes, we keep hearing that this is standard practice since the bamboo torch went out of production years back). Re-inventing this torch is a project we’ve been working on since mid 2016 and we’re delighted to announce that the first shipment of bamboo torches arrived at the shop in late February of 2017. What a piece of equipment! If you’ve seen the GW Blank Making DVD, or if you’ve read The Lovely Reed, you know about this torch, at least in its original incarnation. Now it’s back in black, with an ergonomic grip and a refined torch head! More comfortable and more functional than ever. That narrower torch head allows a modestly thinner stream of heat to impact the culm when held closer, and this means you can create narrower banding when you tiger stripe a culm…but for even heat when heat treating, you just back off a few inches and bathe the culm in a less concentrated swath of flame. What, specifically, can you do with the bamboo torch? You can add color to your culms. Many rodmakers who oven bake their culms, still want the flexibility of adding color. Some makers flame in bands which create a tiger-stripe appearance after you stagger the nodes, while some prefer a mottled pattern of random lighter and darker regions. Extremely creative makers may find ways to mask portions of the culm (after it’s initially heat treated) and then ‘burn-in’ a reverse image of the mask, e.g., cotton cord wound evenly down the culm will slightly mask/insulate the bamboo beneath the cord, allowing it to stay lighter in color than the span of bamboo between the turns of cord. You can also do ALL your heat treating with this bamboo torch. It takes practice, especially if you want an even honey-toned blank with no dark spots, but you should master the skill with a few culms’ worth of practice. Use wood saw horses to elevate your work to a comfortable height (plastic horses will melt; metal horses may build heat and create a scorch line where the culm contacts the horse). Keep the torch head back from the culm about 12-18 inches and “paint” the flame down the culm from the center of the section you’re working on to the right-hand end (if you’re right handed); roll the culm constantly in your left hand (or roll it ‘incrementally’ after each pass from center to the right end)…you’ll need an insulated welder’s gauntlet for this operation because the culm is going to get awfully hot. After a few minutes of heating, the culm will start to outgas water vapor from the hot end of the culm….keep flaming until the steam subsides. Flip the section of the culm and repeat on the other side. Figure 10-15 minutes per side of each section if you’re working 72″ sections…a bit less for 48″ sections. It should go without saying that flaming, like all woodworking operations, is inherently dangerous. You must wear protective equipment, including, but not limited to safety glasses and a welder’s gauntlet on your “rolling” hand. You MUST put a drying split in the culm – full length! – before flaming or the heated air inside the bamboo can cause the bamboo to burst and splinter; alternately, you can ramrod a sharpened piece of steel rebar through the interior of the culm to punch holes in ALL the internodal dams. You may only flame outside. This IS NOT an indoor task both because of the risk of fire and the risk of suffocation (we’ve all heard unfortunate stories about campers who cooked or warmed themselves inside a tent using a small camp stove and wound up falling asleep, permanently). Don’t win a Darwin Award. Think. Work Smart. Work Safe. Keep the gas tank as far behind you as the hose will allow. Read all the literature linked to this page. Keep bystanders at least 20′ back from your flaming operation. If you can’t follow the instructions, or if you’re concerned about your safety, then do not use this tool. A couple of our ‘studio’ pictures, which look cool, show you how NOT to use the torch. For one, don’t get that close to the culm with the flame unless you’re trying to burn the culm and take a photo for Instagram. 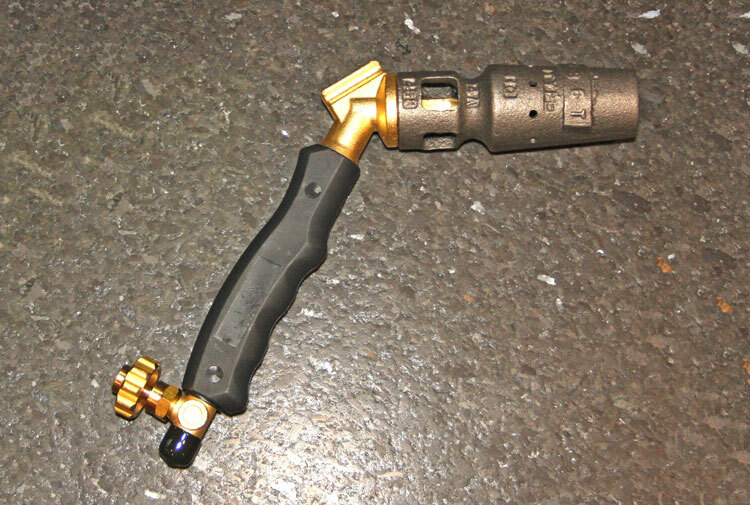 For two, don’t use this torch inside a building, even with a bay door open. Outdoor Use Only. Note on use: If you keep overcooking your bamboo, or you regularly catch the wall of bamboo on fire along the edges of the drying split, there are several things to try. 1) Spin the culm faster and/or move the torch head faster down the length of the culm…it’s a dance, and you need to get in sync while ensuring even flame coverage of the entire culm, both for even color and to drive out moisture evenly. 2) Pull back…get that torch head further from the culm…if you’re scorching at 12 inches, move back to 15 inches. 3) Turn it down…this torch has the power; you probably don’t need all the power, so twist the little knob to dial the flame back. 4) On the other hand, if you’re cooking away and not getting steam after about 7-10 minutes, you need to be slightly more aggressive…move closer, spin slower, dial up the flame; sometimes it helps to ‘overcook’ the very ends of the bamboo section…warm those open pores up and help them get the steam out because they’ll resist outgassing if you cook the center of the culm but leave the very ends cold by comparison. As with all things craft related: practice. And have fun. Used safely and properly, this is a fun process! Save $10 if you buy the torch and hose. As FYI, the fat end of the torch’s hose only fits one sort of gas tank, that’s a standard 20 pound Liquid Propane tank, a.k.a., a standard gas grill tank. A while back, I was talking to Russ Gooding, owner of Golden Witch and friend of The Planing Form. As many of you know, Russ’s personal and professional goals in life are to help bamboo rod-makers create products that they can be proud of. As a rod-maker himself, Russ knows what is needed in our craft and looks for ways to deliver those products to market. Our conversation covered several topics but came around to heat treating and flaming of bamboo during rod construction. Russ mentioned that he and Golden Witch were bringing back a torch that could be used to do both. My interest was piqued. I like a flamed rod and I was having trouble with a reproducible “hot spot” from my home-made mica strip oven, so I could see uses for this torch in my shop. A week or so later, my torch arrived and I was impressed. You know how you can just tell when something is well made? Well, this fit the bill. In addition to looking really cool, the design of the torch was extremely functional and easy to hold. I knew that my rod-making just got better and easier in one product. And that was before I even used it. After purchasing a separate propane tank so that I would not have to keep un-hooking my other one from my grill, I set to work flaming a section of bamboo. Well, six culms later I decided that I should probably stop. It was so easy…and fun! In addition to the cool sound that the torch makes, the ability to flame large sections of cane at one time added to my enjoyment. The wide flame helped with creating an even and uniform color throughout the entire culm. The broad and hot flame helped eliminate the dark nickel sized spots that I had been getting with my smaller torch set-up. Once I got used to the torch (one-culm) and the rhythm of the process, I found it produced much better results than I had achieved before. A true game-changer.